I lived in Kharkov, Ukraine for one year when I was twenty years old. I was one of four young Rabbinical students from a Brooklyn Yeshiva who spent a year in modern USSR. We weren't worried. After all, what was there to worry about? Communism was over, and I had winter gloves. Rabbi Moshe Moskowitz, the chief Rabbi and Chabad representative, along with his wife, Miriam, run Jewish life in Kharkov. Miriam and Moshe were responsible for the four of us being in Kharkov. Sounds simple? Class is in progress. Talk all you want. The kids won't listen; they have gum stuck in their minds. Children are very perceptive. And when my students notice the colorful jars of chewing gum in the synagogue, they know it isn't for the rabbi. Why would the rabbi need three jars full of gum? They figure the gum to be kosher, and they are right. But who is the bubble gum for? I dont know if it's Karl Marx and Russian culture, or maybe it's the age, but whatever it is, it makes giving a present to some of these kids extremely difficult. Because after all, you have three big jars of gum; he or she has none. It is only justice for you to give. Yefim says its not Marxism or anything like that. We simply did it to ourselves, the first Lubavitch pioneers, the ones who came before Coca Cola, when heaven still cost only one dollar. One worker who remembers them won't budge without a promise of vodka. He knows the capabilities of the American. But he doesn't know that seven years ago vodka cost ten cents, and today its ten times that amount. You can't blame them. Who dreamed that things would change? But times have changed. Six years ago the kids here went nuts for cheap video games; today the kids want Sega Genesis, and if it's not Sony, its not worth it. My classroom is subject to intruders all the time. This is due to its location in the middle of the shul. Visitors or beggars don't disturb; only those truly worth it are a distraction. On that day when the two Ukrainian officials walk in, all heads turn. Big Dima, the shul manager, walks them to the office. Senya, the driver, is also in on this. Something is going on, and we know somehow that it is linked with the bubble gum. In accordance with Kharkov tradition, things are kept quiet. Knowledge is power, and that's what separates the men from the boys. The men know what's going on, and the boys have to wait and see. And that's what we do. We watch Senya take the jars and walk out with Dima and the two officers. The two men are from the Ukrainian Health Department. The chewing gum had come on a Humanitarian Aid container, and the department of health wants to make sure everything is okay. Things are tested and found to be okay, except for three jars of gum. The government cannot see the gum as humanitarian. The gum is to be burned, and the two officers are to witness the death of the bubble gum. Lunch break comes, and it is too cold to play outside. My students gather by the window. They too will witness the burning, the mass murder, of hundreds of colorful gum balls. Keeping kosher to these kids means no gum balls. Now, finally, someone who cares, someone named Yefim, has gotten them kosher gum from America. And now this? Where is justice? Where is G‑d? My students have their faces up to the glass. Why? Why are they burning our gum balls? Do they know that the kids are watching? Probably not, but that's only because the execution does not go as well as planned. Senya places a brown cardboard box on the snow near the metal trash bin. The gum balls are poured in, then the gasoline. 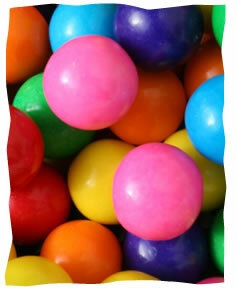 You don't have to be a scientist to know that the box will burn before the gum balls even get hot. And that's what happens. The sides of the brown box curl in pain and quickly turns to ash. The gum balls roll out in a victorious march. Red, green, yellow, blue. The gum balls roll around the parking lot, leaving colored traces in the snow. The officers turn their heads; they have seen enough. The kids are all laughing, and I tell them to get away from the window. The break is over. Class is in progress.